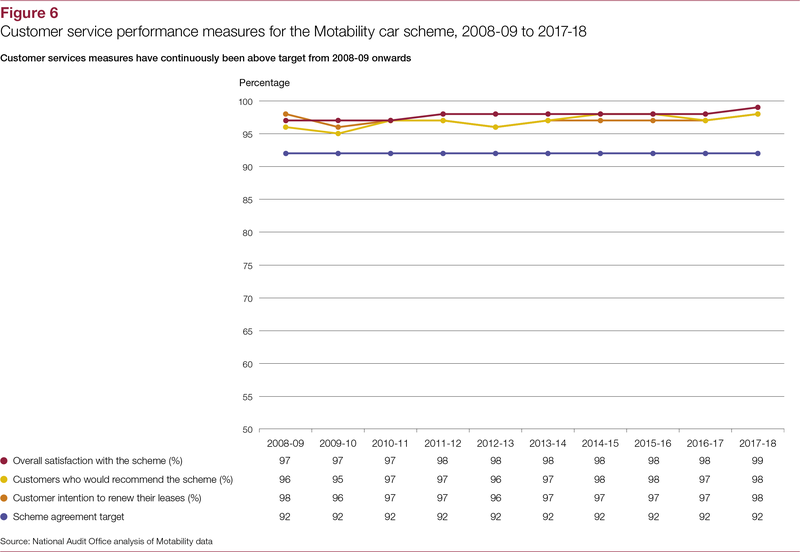 This report considers: the Motability scheme’s customer offer and performance; Motability Operations' financial model; and the scheme's governance arrangements. 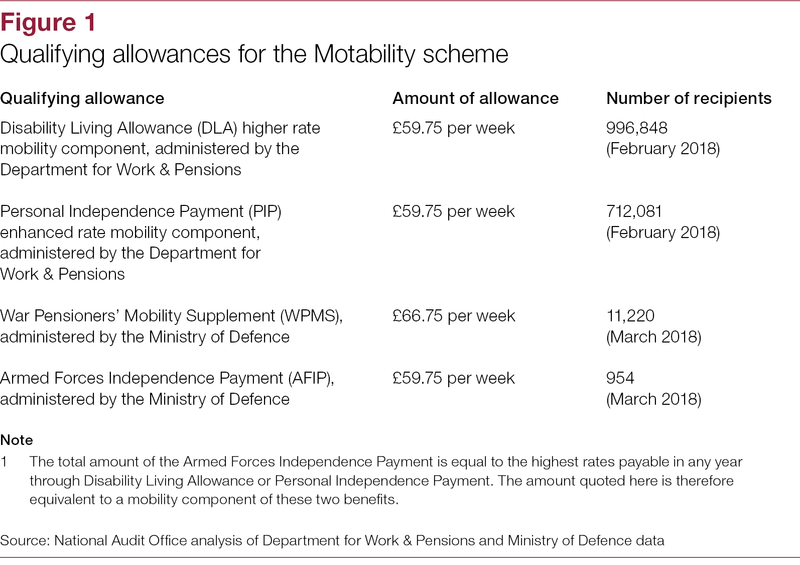 The Motability scheme (the scheme) enables eligible disabled people to choose to exchange certain mobility allowances paid by the Department for Work & Pensions and Ministry of Defence for the lease of a new car, powered wheelchair or scooter. 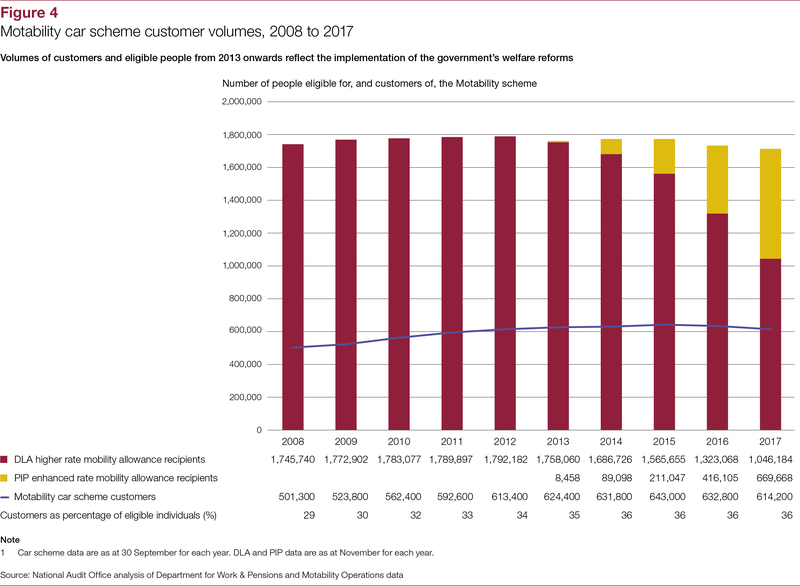 In early 2018, just over 1.7 million people were eligible for the scheme. 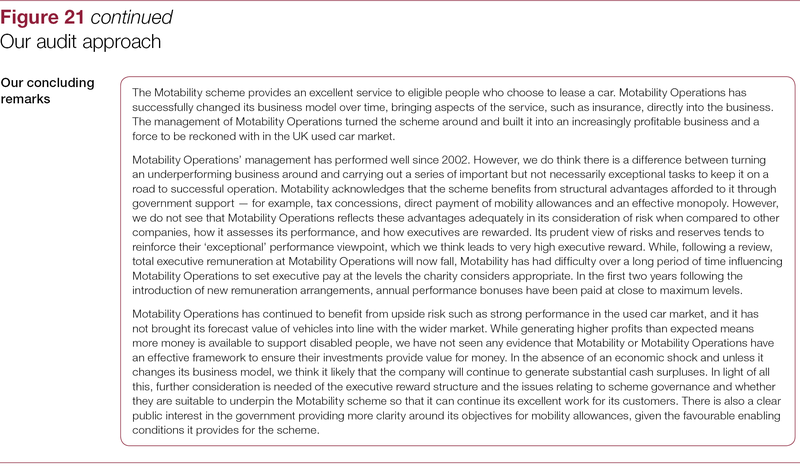 Motability, a charity, is responsible for the strategic direction and oversight of the scheme. 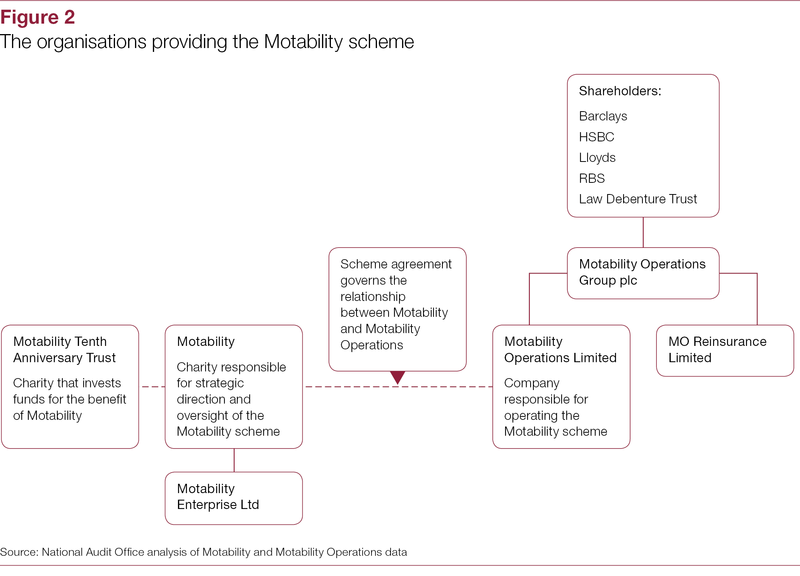 Motability Operations Limited, a public limited company, operates the scheme through an exclusive rolling seven-year contract with Motability, known as the scheme agreement. 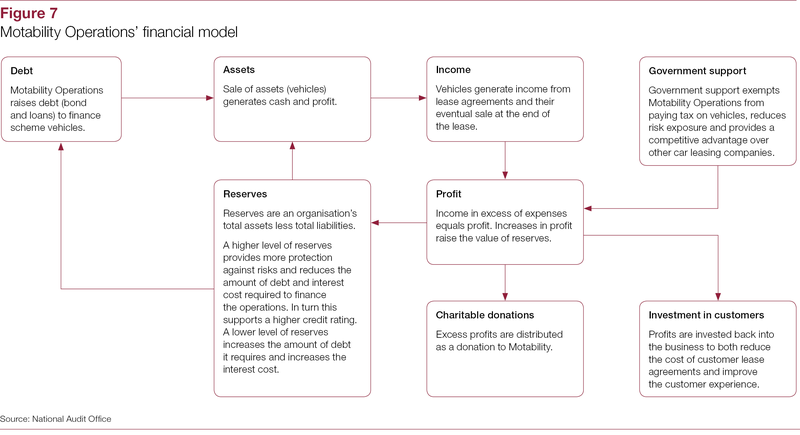 In May 2018, a report by the House of Commons Work and Pensions and Treasury select committees raised questions about: the structures and governance of the scheme; government support for the scheme; the levels of reserves in Motability Operations; the remuneration of its senior staff; and the relationship between Motability and the Department for Work & Pensions. 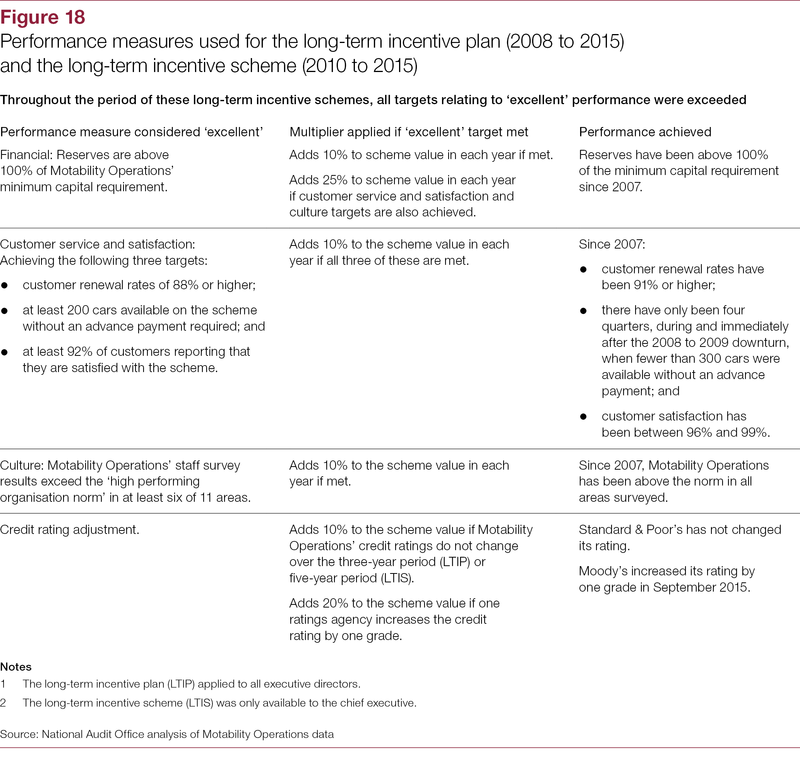 Along with the Secretary of State for Work and Pensions, the Committees recommended that the National Audit Office (NAO) should carry out a review of the scheme. 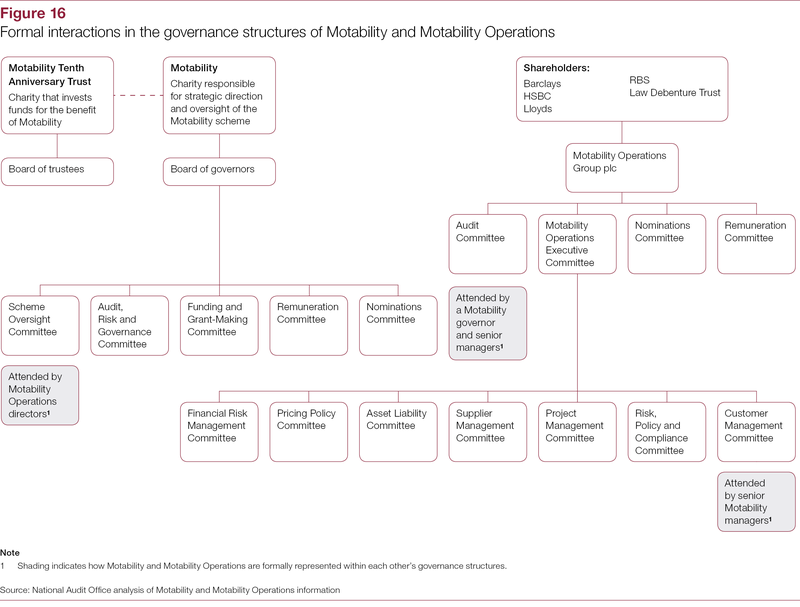 the governance of the scheme and remuneration of Motability Operations’ senior management. 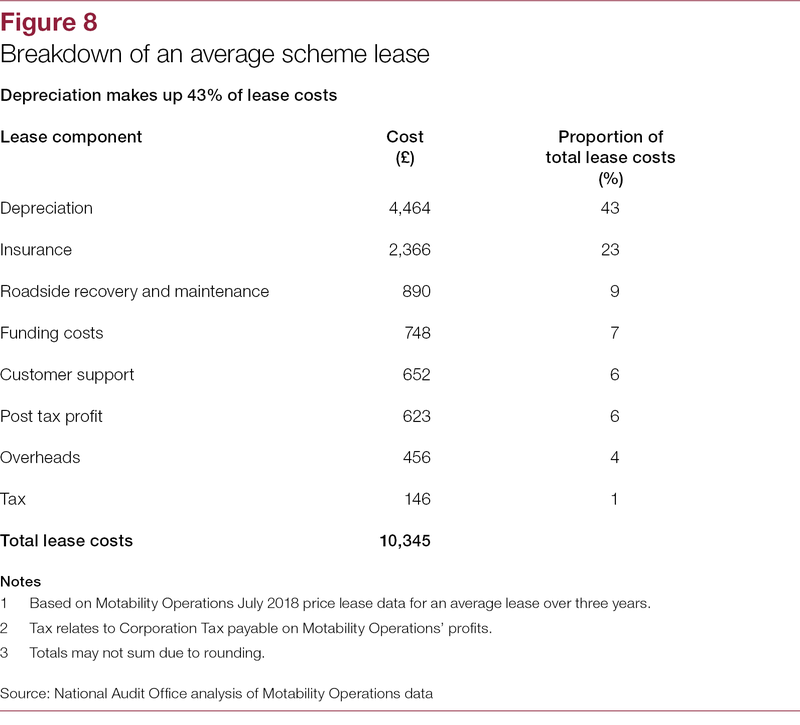 Given the significance of the car scheme in terms of its scale relative to the powered wheelchair and scooter scheme, this report focuses only on the car scheme. Fieldwork was carried out from July to October 2018. 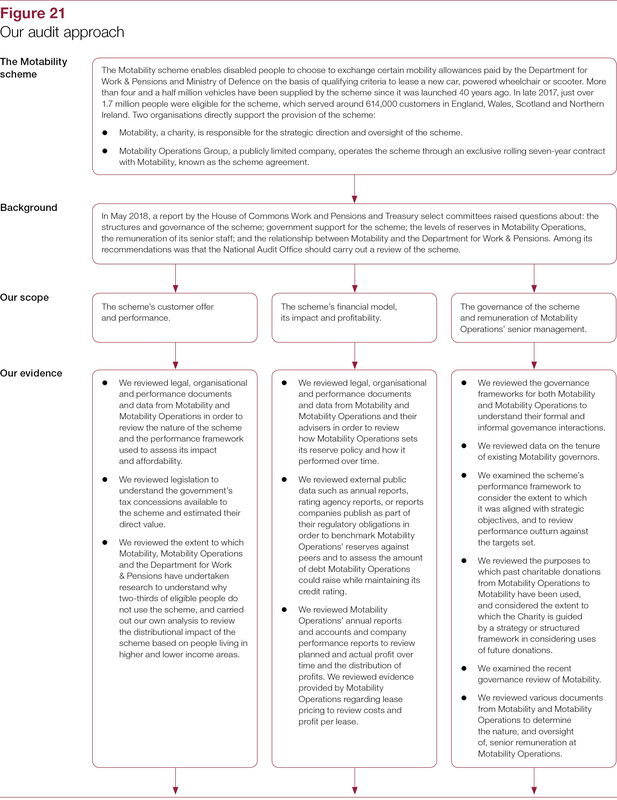 Our approach and methods are set out in Appendix Four. 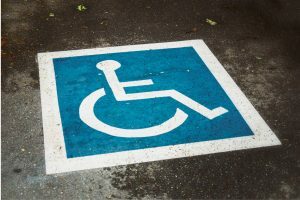 The Motability scheme provides an excellent service to eligible people who choose to lease a car. 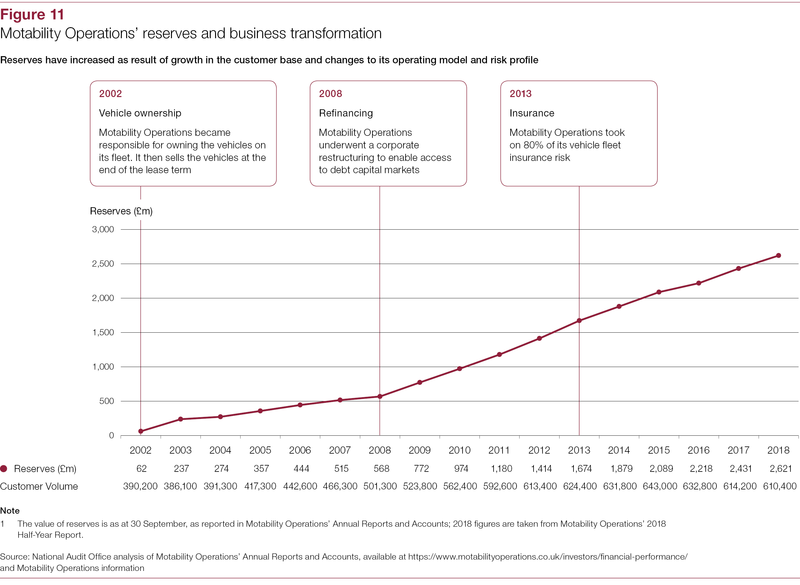 Motability Operations has successfully changed its business model over time, bringing aspects of the service, such as insurance, directly into the business. 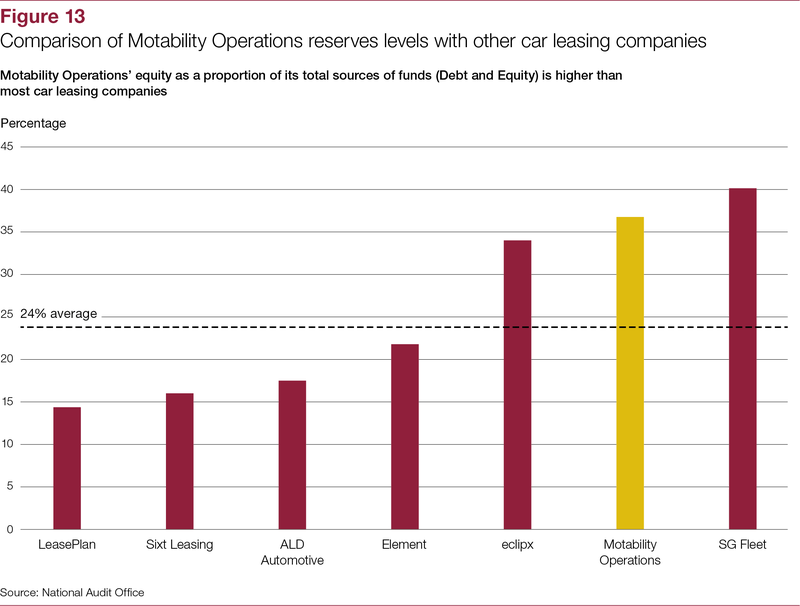 The management of Motability Operations turned the scheme around and built it into an increasingly profitable business and a force to be reckoned with in the UK used car market. 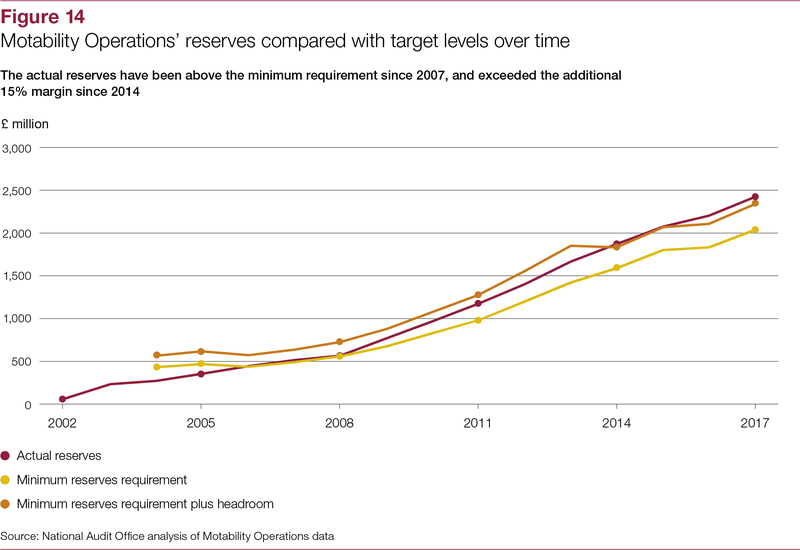 Motability Operations’ management has performed well since 2002. 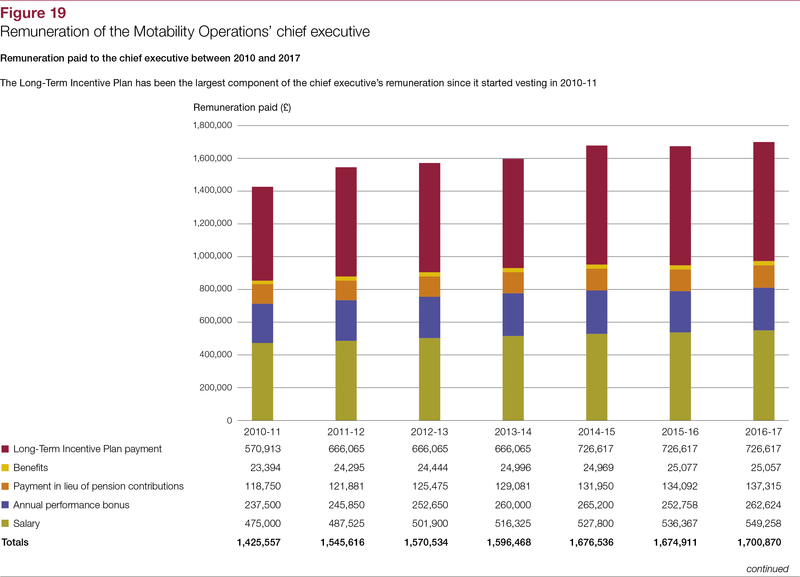 However, we do think there is a difference between turning an underperforming business around and carrying out a series of important but not necessarily exceptional tasks to keep it on a road to successful operation. 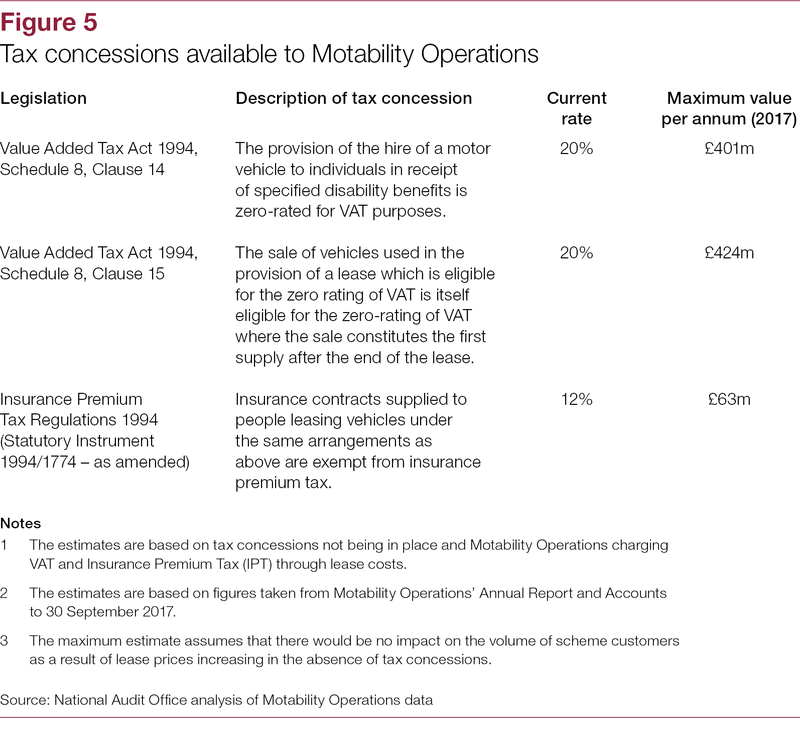 Motability acknowledges that the scheme benefits from structural advantages afforded to it through government support – for example, tax concessions, direct payment of mobility allowances and an effective monopoly. 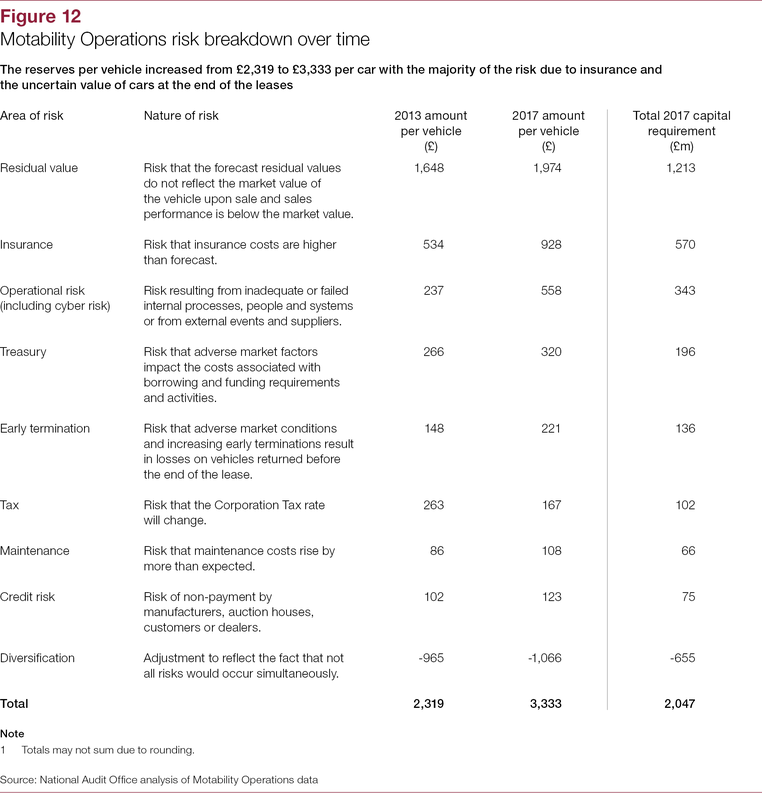 However, we do not see that Motability Operations reflects these advantages adequately in its consideration of risk when compared to other companies, how it assesses its performance, and how executives are rewarded. 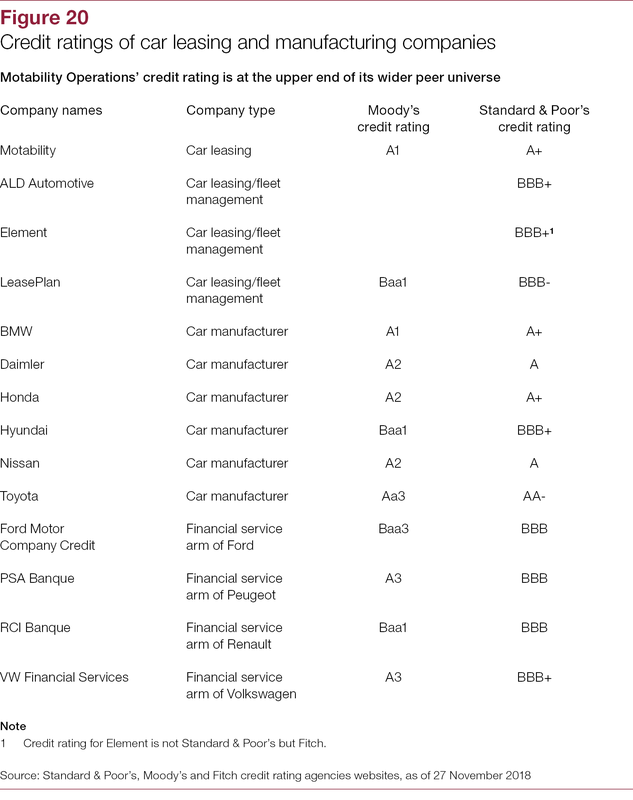 Its prudent view of risks and reserves tends to reinforce their ‘exceptional’ performance viewpoint, which we think leads to very high executive reward. 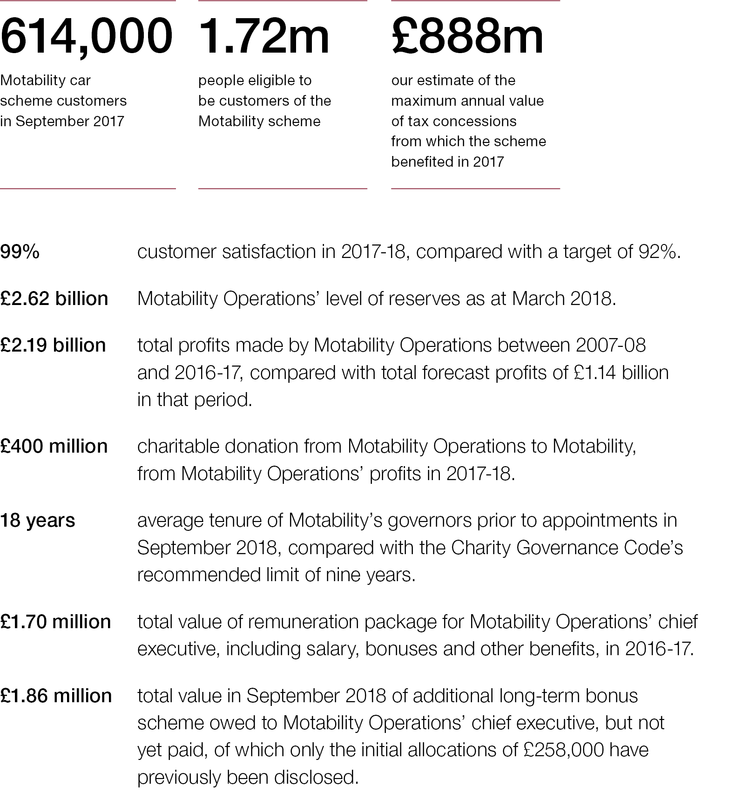 While, following a review, total executive remuneration at Motability Operations will now fall, Motability has had difficulty over a long period of time influencing Motability Operations to set executive pay at the levels the charity considers appropriate. 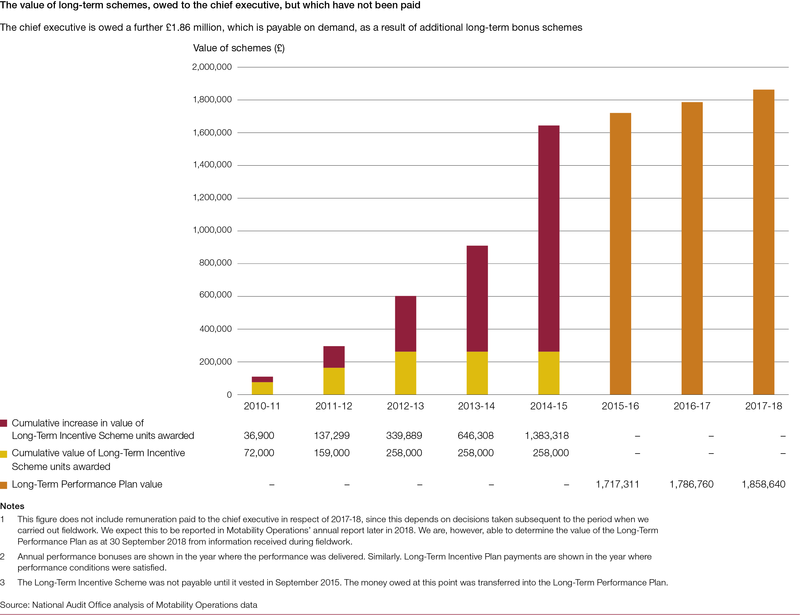 In the first two years following the introduction of new remuneration arrangements, annual performance bonuses have been paid at close to maximum levels. 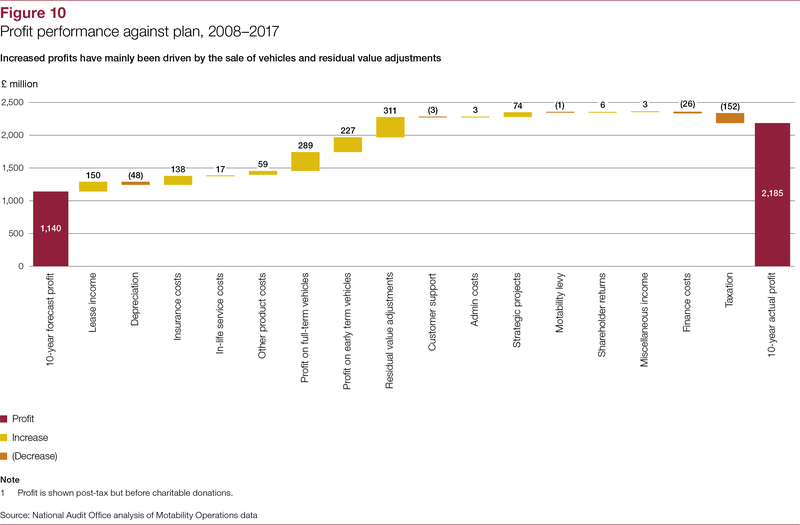 Motability Operations has continued to benefit from upside risk such as strong performance in the used car market, and it has not brought its forecast value of vehicles into line with the wider market. 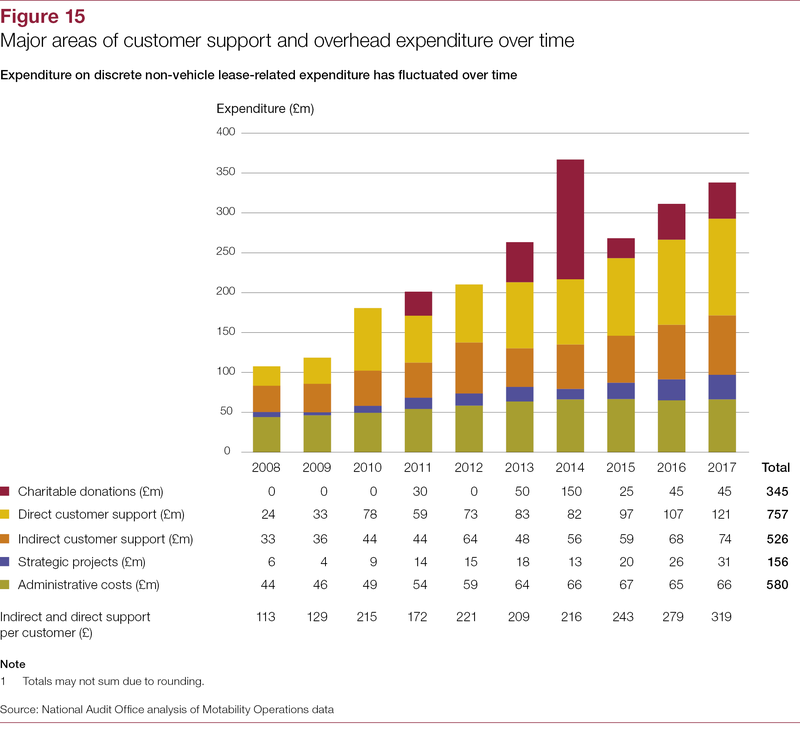 While generating higher profits than expected means more money is available to support disabled people, we have not seen any evidence that Motability or Motability Operations have an effective framework to ensure their investments provide value for money. 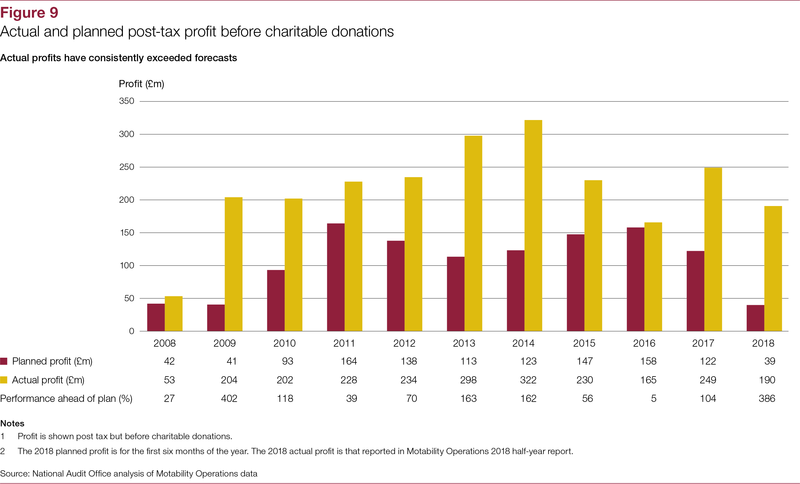 In the absence of an economic shock and unless it changes its business model, we think it likely that the company will continue to generate substantial cash surpluses. 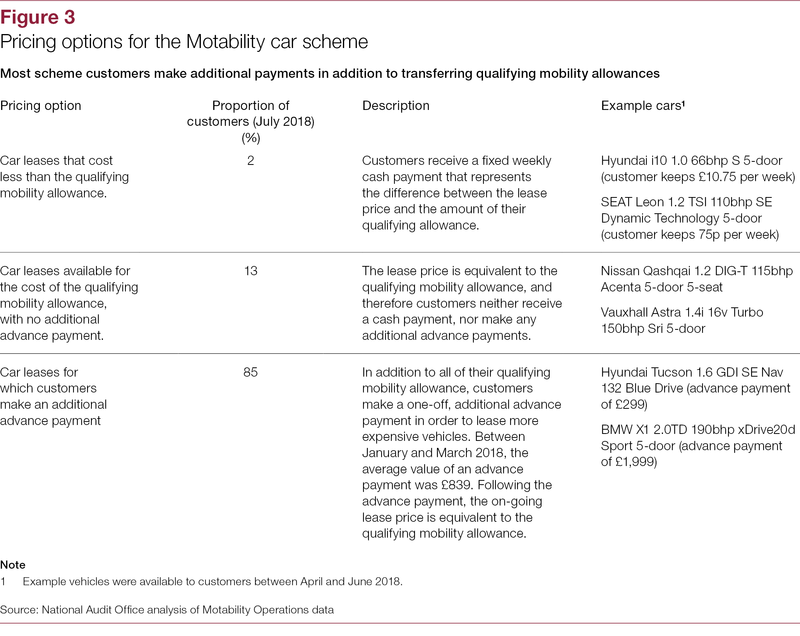 In light of all this, further consideration is needed of the executive reward structure and the issues relating to scheme governance and whether they are suitable to underpin the Motability scheme so that it can continue its excellent work for its customers. 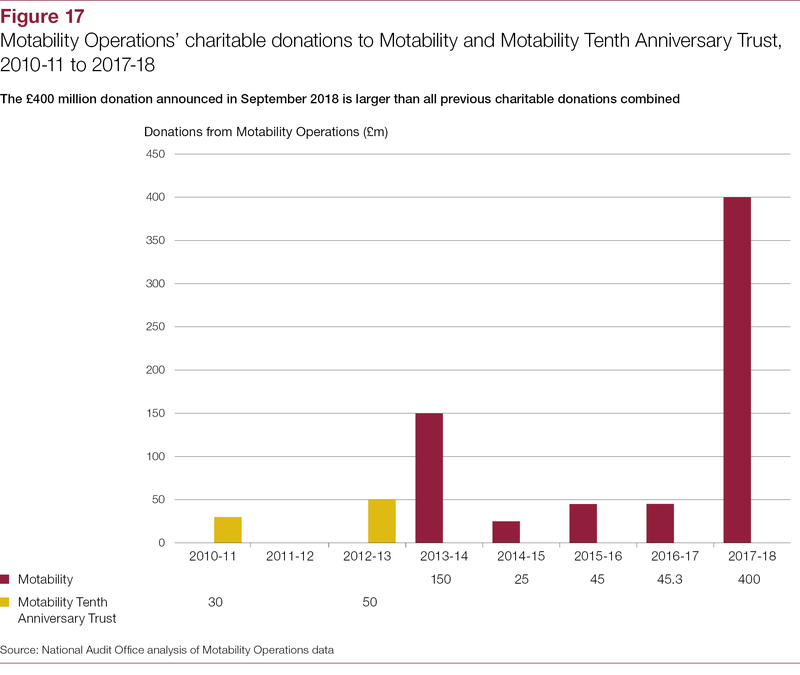 There is also a clear public interest in the government providing more clarity around its objectives for mobility allowances, given the favourable enabling conditions it provides for the scheme.